Organizations are facing numerous challenges with the pace of technological development therefore they need efficient system to survive in marketplace. To manage organizational activities successfully, Job design has distinct role. It offers the necessary information about the incumbent and also identifies the way of performing the tasks. Job design is fundamentally concerned with the individual’s job, work enthusiasm and developing good behaviour in an organization. Many experts described job design as specification of the contents, methods, and relationships of jobs in order to satisfy technological and organizational requirements as well as the social and personal requirements of the job holder (Buchanan, 1979). Job design mainly focuses on designing the process of change of inputs into outputs and considers the human and organizational factors that impact that transformation. Its main objectives are greater job satisfaction, increased performance, reduced absentees and more prosperity. Earlier, researchers described job design as the set of opportunities and constraints structured into assigned tasks and responsibilities that influence how a worker accomplishes and experiences work (Hackman and Oldham, 1980). In today’s work set up, job design is explained as encapsulating the processes and outcomes of how work is structured, organized, experienced, and enacted (Morgeson & Humphrey, 2008). Major theoretical perspectives and empirical findings in the job design includes economic perspectives on the division of labour, the human relations movement and the emergence of job enrichment, the job characteristics model, the social information processing perspective, sociotechnical systems theory, interdisciplinary frameworks, and models of job demands. Job design theory and research is grounded in economic perspectives on the division of labour (Smith, 1776). Economists, Smith and Babbage proposed that productivity could be improved if jobs were broken down into simple tasks. The principle behind this thought was that division of labour and simplification would permit workers to develop specialized skills and efficient techniques to finish tasks, as well as to eradicate distractions and reduce time wasted while switching tasks (Morgeson and Campion, 2003). Another theoretical framework of job design is the human relations movement. Theorists who proposed this principle were extremely concerned about the well-being, satisfaction, and motivation of employees. They initiated the classic Hawthorne studies to improve environmental conditions. Likert and McGregor highlighted the potential value of reducing managerial control in designing jobs to provide employees with freedom to fulfil their psychological needs. Their perspectives dovetailed with the work of Herzberg and colleagues, who introduced the concept of job enrichment to applied psychology and organizational behaviour. Theorists proposed motivator-hygiene theory, which argues that job satisfaction and dissatisfaction are different states caused by different forces (Herzberg, 1966). Sociotechnical systems theory is directly related to job design theory and research (Rousseau, 1977). A core principle of sociotechnical systems theory is that individual and organizational effectiveness depend on the joint optimization of human and mechanical-technological constituents of organizations (Trist, 1981). Main processes or procedures of job design are job rotation, job enlargement, job enrichment, self-managing teams and high performance work design (Armstrong, 2003). Theorists also identified other methods for job design that other include job reengineering, participative management and peer performance review (Durai, 2010). The first job design theory was proposed by Viteles in the early 1950s. In this theory, both job rotation and job enlargement were used to address the problems originating from the reduction of employee self-esteem and productivity, because of the job boredom from job specialization (Hsieh and Chao, 2004). Furthermore, job rotation and job enlargement were developed to be benefited from the job specialization stemming from the job engineering method (Ali and Aroosiya, 2012). 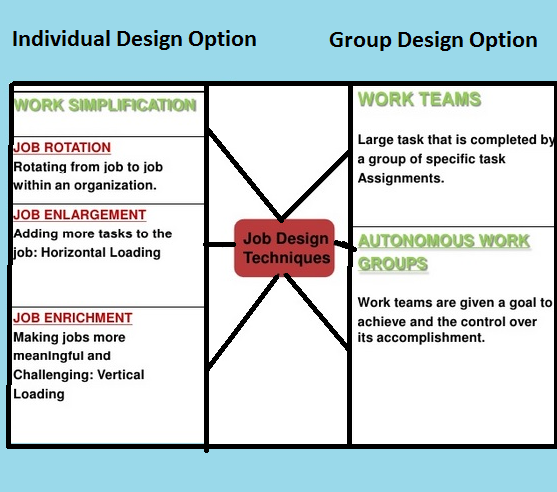 First technique of job design is Job rotation which allows employees to rotate from one job to another, in a predetermined way (Durai, 2010). In order to make the job rotation procedure effective and the employee not be rotated in an inappropriate job position, four factors must be considered such as a) the gender of the employee, b) the physical demands of the job position, c) the knowledge, skills and capacities of the employee and d) the demands and the time needed for performing other tasks (Carnahan et al., 2000). Job rotation is considered as a method for control the work-related musculoskeletal disorders (Asensio-Cuesta et al., 2012), to reduce the exposure to work-related injuries(Jorgensen et al., 2005) and dangerous noise levels (Tharmmaphornphilas et al., 2003), and to reduce exposure to strenuous materials handling (Carnahan et al., 2000). Job enlargement is the second procedure of job design that transforms the jobs to include more and/or different tasks (Durai, 2010). The primary objective of job enlargement is to encourage the interest of employee in the job, namely increasing job attraction, through the differentiated and various tasks that the employee performs in his/her job. Subsequently, the purpose of job enlargement is to design jobs where the requirements of employees meet the interests of the organisation (Durai, 2010). There are two approaches of job enlargement. The first is the horizontal enlargement, which denotes to the degree to which a job contains many tasks (Durai, 2010). This is accomplished through adding more tasks to the existing tasks performed by a worker at the same skill level. The general goal of horizontal enlargement is to decrease the level of specialization and monotony of work, to lessen the number of difficult tasks, and finally to lead towards the development of new employee skills. This approach is usually chosen in complex and highly structured tasks (Durai, 2010). The second type is vertical enlargement, which refers to “the degree to which the employees decide how the task is to be done” (Durai, 2010). The purpose of this system is to augment the status and the self-fulfilment needs of the workers, while offers good opportunity to the employees to participate in the organisation, the planning and the control of tasks (Durai, 2010). Job enrichment is described by scholars as the development of work practices that challenge and motivate employees to perform better (Durai, 2010). Fundamentally, Job enrichment “is the technique involves enriching job, which refers to the inclusion of greater variety of work content, requiring a higher level of knowledge and skill, giving workers, autonomy and responsibility in terms of planning, directing, and controlling their own performance, and providing the opportunity for personal growth and meaningful work experience” (Ali and Aroosiya, 2012). Factors that greatly affect job design are organizational, environmental and behaviour factors. Organizational factors include work flow, agronomics and work practices. Environmental factors are employee ability and availability, social and cultural expectation. 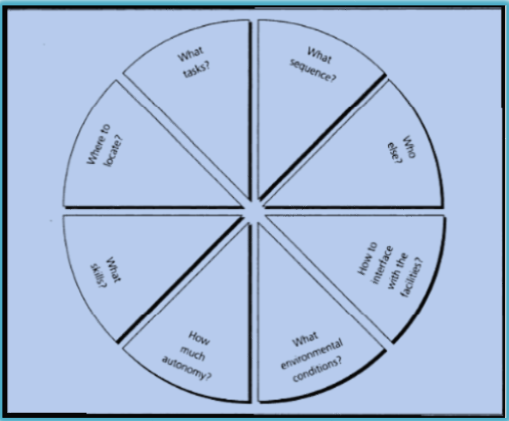 Behaviour factors include feedback, and use of abilities. Organizational Design: The job design indicates the contents and procedures of performing the task in the organization. Therefore, it helps in designing organizational structure. The organizational structure is determined by the job design process. It plays a key role to evaluate the need and requirement of organizational structure. Job design also specifies organizational culture, norms and values that workers need to follow to accomplish organizational goals. Structure of Competent Employee: Job design is a methodical approach to give job-related data and information on skills, knowledge and capability of the incumbent to execute the task. On the basis of the information provided by it, the job description and job specification schedule are organized, which helps to the capable candidate for the job. It provides good information to select the competent employee who is competent of performing the task in the organization. Motivation and Commitment of Employees: Job design makes the work more interesting and challenging, which motivates the workers to give best performance. The challenging and interesting job provides better pay for the employees which inspire them for better job performance. Along with inspiration, job design also brings high degree of dedication in them towards organizational objectives. This helps to boost organizational productivity and employee happiness at work. Environmental Adaptation: An organization is operated in a vibrant environment. Therefore, any change in the environmental forces can have direct impact upon organizational performance. An organized job design process addresses the change that has occurred in the organizational environment. The process of job design and job redesign is organized in such a way that it adapts the change in the environmental forces. Labour Relation: A well-equipped job design brings good relation between employees and management. Poorly prepared job design creates employee-grievances, in-disciplinary actions, employee turnover, greater absenteeism and conflict. Quality of Work Life: A quality of work life is recognized as healthy relationship between employees and organizational working environment. A suitably organized job design leads to improvements in quality of work life. With a good design of work schedules, people have vision of good career growth in organization which finally leads to high inspiration at work and a positive change in their thoughts and attitude. These changes will have a direct impact upon the quality of work life. Organizational Productivity: The job design indicates the contents and working procedures of how the task is performed. This leads to a positive change in job performance and job analysis. Accordingly, the organizational output will be enhanced through proficient work performance. It is well established in management literature that job design is an efficient organization of job-related tasks, responsibilities, functions and duties. It is a constant process of integration of content related to job to accomplish organizational objectives. The process plays an imperative role as it affects the output of employees and organizations. Nevertheless, in current business environment, there are various issues in designing the jobs in organizations. These are alternative work patterns that are equally useful in handling organization’s functions.